In the SharePoint application I’m currently working on, I configured Form Based Authentication (FBA) using the SqlMembershipProvider and SqlRoleProvider. Implementing some user management functionality, I run into the lack of a method to get the users in particular role by portions (so-called pagination). The SqlRoleProvider exposes the GetUsersInRole method which returns only names of users in the passed role and doesn’t support pagination. The direct way in this case is to get user names and then get appropriate users, calling the GetUser method of SqlMembershipProvider one time per name. This approach results in a bunch of requests to the database: one request is to get names of users in a role and a number of requests are to get each user by his name. In addition, we have somehow to implement pagination ourselves. The approach is acceptable, but let’s try to reduce requests to the database and borrow somewhere the pagination logic. It’s interesting that the SqlMembershipProvider provides the GetAllUsers method that supports pagination. On the database level, every call of SqlMembershipProvider.GetUsersInRole and SqlMembershipProvider.GetAllUsers ends with executing such Stored Procedures as aspnet_UsersInRoles_GetUsersInRoles and aspnet_Membership_GetAllUsers respectively. So, we know that the aspnet_UsersInRoles_GetUsersInRoles searches for names of users in a role while the aspnet_Membership_GetAllUsers is able to return users by portions. Let’s combine these two Stored Procedures and create another one which would select users in a role and return a required portion of the result. The sql script below creates such Stored Procedure, I named it aspnet_Membership_GetAllUsersInRole. Note the script should be executed on MembershipProvider database, it’s aspnetdb in my case. The code of GetAllUsersInRole method is mainly based on the GetAllUsers of the parent SqlMembershipProvider class. Note the EventLogger class is described in the post SharePoint: Simple Event Logger while the GetFieldValue method is provided by ReflectionHelper described in the C#: How to set or get value of a private or internal field through the Reflection and C#: How to set or get value of a private or internal property through the Reflection. The latest version of the SqlMembershipProviderEx along with all used additional classes are available to download here. The given post is an extension to the one How to set or get value of a private or internal property through the Reflection. So, here are two more methods to add to the ReflectionHelper. These methods are implemented as extensions to the object class and simplify getting and setting values of object’s private and internal fields. 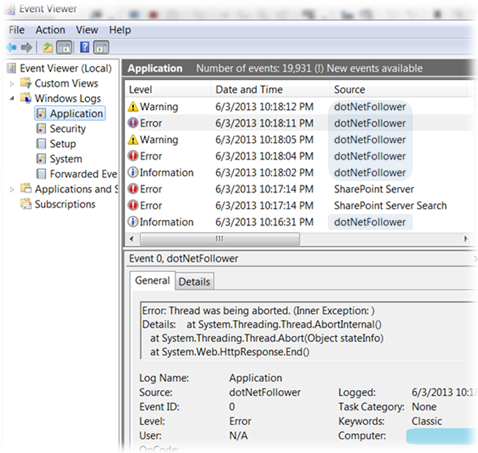 Errors, warnings and info messages in all my SharePoint applications are being logged to the Application Event Log. For that I use a simple class tritely named EventLogger and listed later in this post. As for the moment, a couple of words about the EventLogger are stated below. If necessary, the EventLogger registers a source in the Application Event Log once any its method is called for the first time (see the static constructor). The event logging uses the information stored in the Eventlog registry key. So, when dealing with the Application Event Log, we have to be ready to get exception about a lack of rights to read from or write to the registry. Because of that, the EventLogger initially tries adding a new source under the current user account and then, in case of failure, repeats the same under the application pool account (SPSecurity.RunWithElevatedPrivileges) that is supposed to have all suitable permissions. Due to the same reason, whenever a user different from the application pool account writes anything to the log, he will likely get an exception which is reporting that the current user doesn’t have write access. To guard users from that, we as administrators have to do some manual work, namely, to add the CustomSD value to the [HKEY_LOCAL_MACHINE\SYSTEM\CurrentControlSet\services\eventlog\Application] registry key how it’s described in the article SharePoint: Cannot open log for source. You may not have write access. If a SharePoint application supports anonymous access, use WD (all users) instead of AU (authenticated users). Also it’s very important to understand that the appropriate CustomSD must be added on all machines of a SharePoint farm. An alternative way is to wrap the writing to the log in SPSecurity.RunWithElevatedPrivileges. Remember, however, that the SPSecurity.RunWithElevatedPrivileges is quite resource-consuming and excessive for such frequent operation as event logging. So, use the SPSecurity.RunWithElevatedPrivileges as an extreme measure and only when the previous approach with CustomSD didn’t help for some reasons. Another feature of the EventLogger is that, as a backup plan, it writes to the SharePoint Trace Log through the Unified Logging Service (see the WriteToHiveLog method). In other words, if the EventLogger doesn’t manage to write a message to the Application Event Log, it tries appending the message to the ULS Log stored in the file system and accessible, for example, through the ULS Viewer. Logging an error or warning based on the passed exception, the EventLogger forms the final text, using the exception’s message along with the message of the inner exception (if any) and stack trace. Below is a combined example that demonstrates how to use the EventLogger to log errors, warnings and info. // resource-consuming and looks excessive for such frequent operation as event logging. SharePoint: Cannot open log for source. You may not have write access.